Hunker Down or Get Gone? As I write this at home in the UK, the rain lashes against the windows of my study. Outside, gale force winds drive impressive waves against the River Tamar's outgoing tide. Strangely, the air is warm and humid; a mute clue to its distant tropical origin. The much depleted remnant of Maria, the devastating hurricane which all but destroyed several Caribbean Islands just a few days ago, is paying us a brief visit. First it was Hurricane Irma that hit the Leeward Islands. Antigua was spared, but the islands to the north were decimated, none more so than Barbuda. 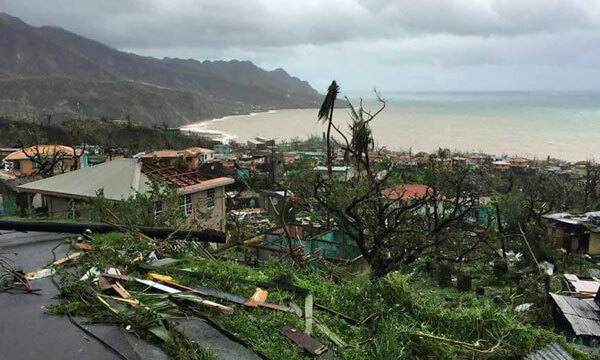 The 7,000 inhabitants there lost everything and were evacuated to their sister island Antigua, the two islands together being an independent island state. The other islands including St Barts, St Martin and St Maarten, Anguilla, and the Virgin Islands are overseas territories of a Sovereign State such as the US, the UK, France, and Holland. They too are in a desperate situation and can rightly expect to be well supported by their associated country. Then came Hurricane Maria, a category 5 monster which made its landfall on Dominica, an independent island nation of some 73,000 people, and the favourite Caribbean island of many of us cruising sailors. In terms of money, Dominica is a poor island. But it is immensely rich in other ways — the warmth of its people, the tropical fruits and vegetables from its fertile soil and abundant vegetation, and the unspoiled natural beauty of the island. Dominica has no valuable mineral resources and its income is primarily derived from its tropical produce and eco-tourism. Now it's rain forest is largely gone as are crops and plantations, it's towns and villages destroyed, roads and bridges severely damaged. There's no power or clean running water. All that remains of this former island paradise is the warmth of its people, and they desperately need our help. Please join me in making a donation via Disaster Relief Fund for PAYS Organisation in Portsmouth, Dominica. In its basic form its free - and even at that level it's extremely useful for us cruisers. You can access it at PredictWind.com. If you choose to sign up for one of the paid versions of PredictWind you'll get a lot more functionality, but for the time being I'm happy with the free version. It's an animated wind prediction program - I used it for tracking Irma and Maria as they rolled relentlessly towards the northern Caribbean, extremely mindful of where 'Alacazam' was laid-up in Jolly Harbour, Antigua. As it turned out, unlike so many owners elsewhere, we were very, very fortunate. Rather than laying their boats up for the Caribbean hurricane season, quite a few cruisers choose to stay put, enjoying the much less crowded anchorages and sublime summer breezes. Weigh anchor and get out of the hurricane's path. If you choose the first option, never be tempted to stay aboard. Do the best you can for the boat then find a safe spot ashore to hole up until the danger has passed. The boat can be replaced - that's what insurance is for - you and your crew cannot. Option 2 should always be considered carefully. Can you reach a safe haven in the time available? Is there a risk that the hurricane could veer out of its predicted cone and catch you at sea? If you do decide to make a run for it, this is one situation where a performance cruising boat will score over a heavy displacement plodder. "What are those creatures in the Frangipani tree?" I asked a man at Antigua's National Sailing Academy. "Dem's worms" he told me, "you gotta knock'em down and squash'em." It's not in my nature to squash any living creature, but I did decide to take a closer look. They're caterpillars of course, not worms, and they're big - about 6" long. They have a large orange head at one end and an impressive spike at the other. I thought I might let one crawl on my hand. Whilst keeping a wary eye on the spiky end, the other end reared up and gave me quite a nip on my finger. I got the message and decided to leave well alone after that. 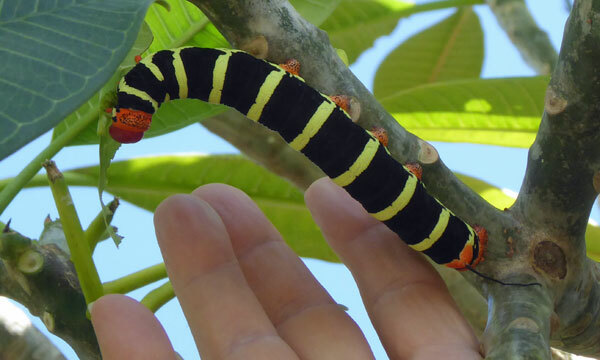 More accurately they're known as the Frangipani Hornworm, on account of the aforementioned spike, and are the lava of the Giant Gray Sphinx moth. Owing to their long, needle-like proboscis and the way they hover and dart about when feeding a flower's nectar, they are sometimes mistaken for hummingbirds. And, like hummingbirds and bees, the Giant Gray Sphinx Moth (aka the Tetrio Sphinx Moth) carries pollen from one plant to another thus providing a valuable service. Just a small thing this, but you may have noticed the 'more about...' annotation on some of the cruising yacht pics on the website. This is a recent addition and clicking on it will take the reader to an external source of additional information about that yacht. Often this will be a report of a sea trial by a sailing magazine, an owners review or a page from the manufacturer's brochure. It's intended to provide more interest and information for our visitors - which of course is what sailboat-cruising.com is all about. It got quite a response, but only two possible manufacturers were suggested. 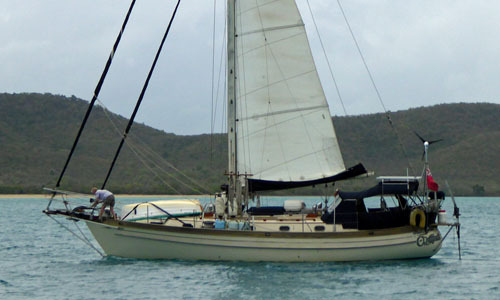 The most popular suggestion was the Westsail 43, and I can see why so many of you thought she was one of these. The bowsprit, cutter rig, canoe stern and coachroof are very similar - but Westsails of this size have the shrouds attached to external chainplates which are quite visible on the hull sides. Next in the popularity stakes was the Hans Christian, with the 41 and the 43 given equal support. Once again, this boat looks very much like either of these. But isn't the bow just a little too straight? Both the HC41 and the HC43 have a pronounced curve to the bow, which leads me to conclude that this boat isn't an HC either. So I'm leaving the boat up for another month to see if one of you can make a positive identification. The boat name is C-Drifters and she's British Registered. Googling the name didn't get me anywhere except to confirm that she's currently cruising in the West Indies, which I knew anyway.